Frank Vignola and Vinny Raniolo. 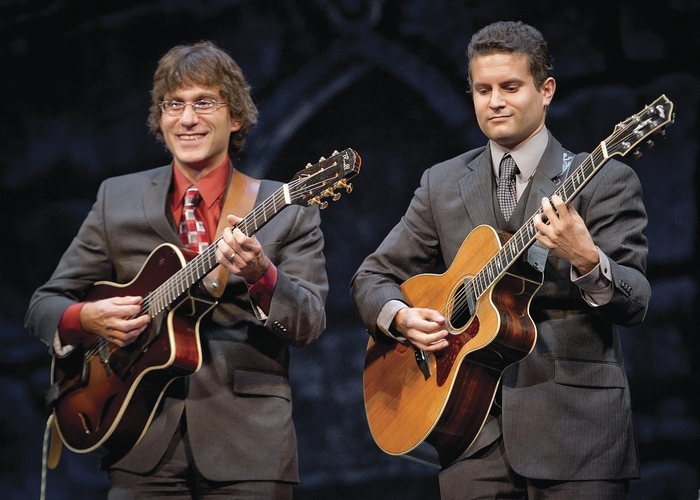 NEW YORK jazz guitar duo, Frank Vignola and Vinny Raniolo, perform the opening concert of the Galway Jazz Festival tomorrow at 8pm in the Nuns Island Theatre. Frank Vignola is regarded as one of the world’s most extraordinary contemporary guitarists, renowned for his stunning virtuosity. He was a member of Les Paul’s band for many years - Les Paul named Vignola as one of his favourite five guitarists for the Wall Street Journal. He has also worked with Steely Dan’s Donald Fagan, Wynton Marsalis, Madonna, and Ringo Starr. Vinny Raniolo is a prolific touring and studio musician, arranger, and educator. As well as his collaborations with Frank Vignola, he has also worked with Tommy Emmanuel, Tony Trishka, Matt Flinner, and Ken Peplowski. The Galway Jazz Festival will be officially opened in the Mick Lally Theatre, Druid Lane at 6pm tomorrow, with a performance by the Headford Youth Jazz Ensemble and dance troupe The Dipsy Doodles.